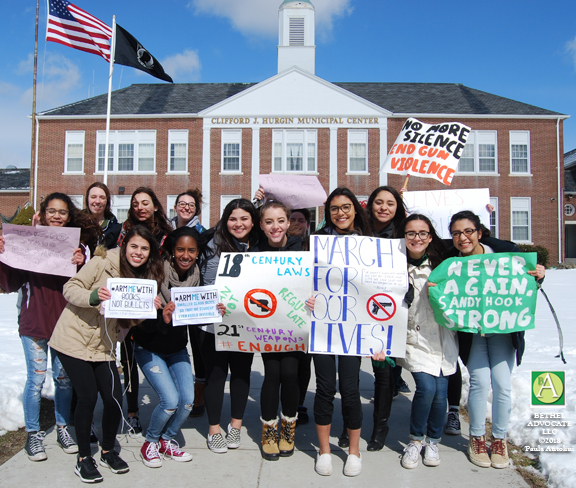 Thousands of students across the nation rallied virtually together on March 14, 2018, in the #ENOUGH! National School Walkout, hosted by the Women’s March and Women’s March Youth, to protest gun violence and hold a memorial for the 17 Florida school shooting victims, by participating in a “walkout” while school was in session. 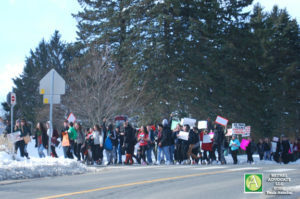 Approximately 75 Bethel High School (BHS) students defied school authority (despite warnings of discipline in an earlier email from BHS Principal Troetti) and participated in the “walkout” by leaving the school building after the “Advisory” event in the BHS gym. Students poured out of the BHS front entrance en masse, yelling loudly, walking quickly, and more were seen exiting a side door (you can view in video below). 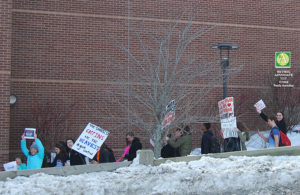 Many students carried protest signs. Some students left the campus and walked into town and some students were on the CJH Municipal Center lawn. Students there said ten 18-year-old students registered to vote and First Selectman Matt Knickerbocker had greeted them and encouraged them in their cause. Other students stayed in school for the presentation (called an “Advisory” in Bethel) but then went back to class until dismissal time. Note: The video was cut short because the student’s ride arrived (car) but no word on whether they returned to school or home or other location. 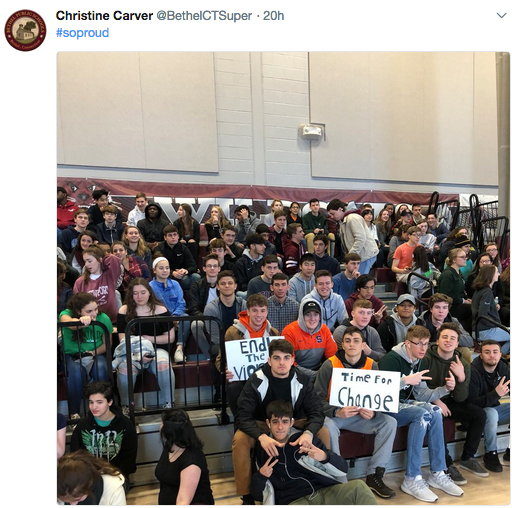 Today’s Bethel Public Schools indoor “Advisory” event, which was to be a memorial to the 17 victims from the February 14, 2018 school shooting at Marjory Stoneman Douglas High School in Parkland, Florida, and a way to let student voices be heard, was held from 9:35am to 10:20am in the school gym. 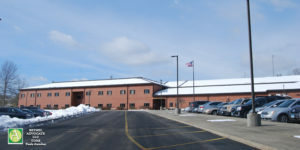 The event was previously to be on the BHS field, but due to snow covering the field plans were changed. 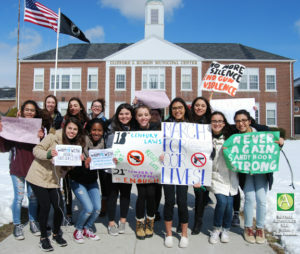 The events today were in solidarity with the #Enough National School Walkout movement, which stems from Women’s March Youth EMPOWER “calling for students, teachers, school administrators, parents and allies to take part in a #NationalSchoolWalkout for 17 minutes at 10am across every time zone on March 14, 2018″ to combat gun violence,” reads the website. 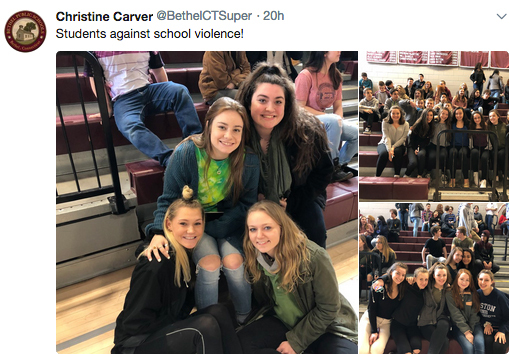 During the “Advisory” event BethelPublic Schools Superintendent Dr. Carver posted several photos on her twitter account (view below). 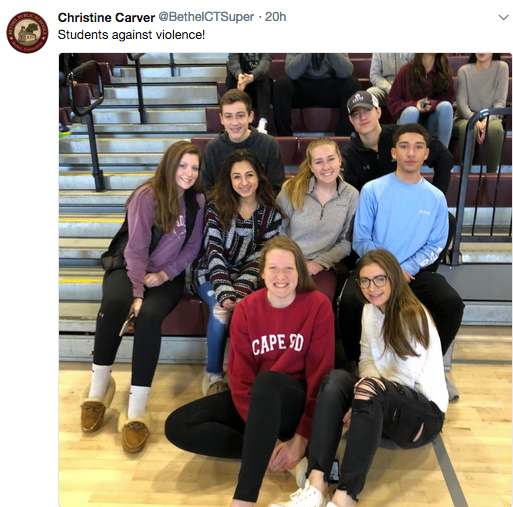 Five students stood in the front of the gym (we are assuming after the “emergency procedures” info. section of the Advisory were discussed) and they read the names of the 17 victims then a moment of silence was held. “Just one month ago in Parkland, Florida, a gunman stormed Marjory Stoneman Douglas High School and killed 17 people,” said Audrey Garcia, a junior. 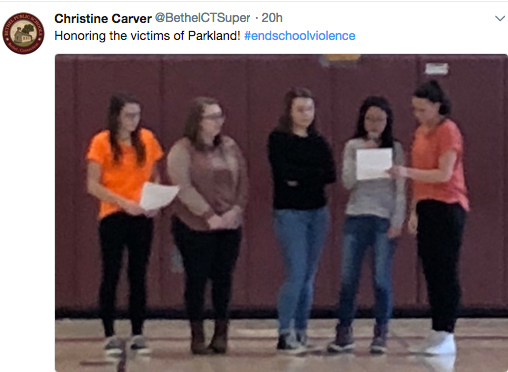 Each of the 5 students standing in front of the gym read 3-4 names each of the Parkland victims. “Let us take a moment to honor the many teens and adults who passed,” said Garcia. A moment of silence was observed. “So the person sitting next to you may have a completely different point of view of how to take action. It’s the conversations you have with those people that are meaningful an important. It’s not shouting one decision is most important, one action is the most important, it’s all your reflected actions together. So if you believe something that’s different than others, don’t be afraid to talk about it,” Troetti said. An edited 7:40 video of today’s indoor “Advisory” event was eventually posted on the school’s BETV website by the school, view here. 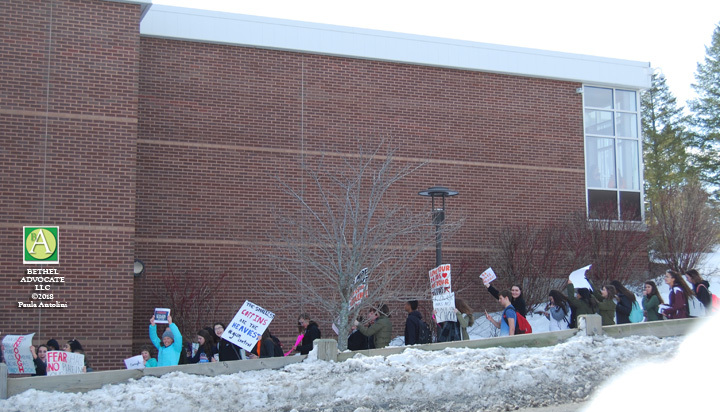 Photos above: Bethel High School students exit front and side doors of BHS building to start their protest on March 14th. 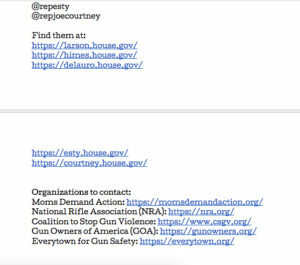 “Student Violence – Resources” was sent to students on 3-15-18 and read : Attached is the list of resources we mentioned in today’s assembly,” but sent from student Joely Feder’s school email address, and sent to all students in Class of 2018, Class of 2019, Class of 2020, and Class of 2019. 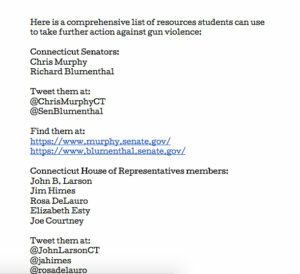 View resources sent to students, below. 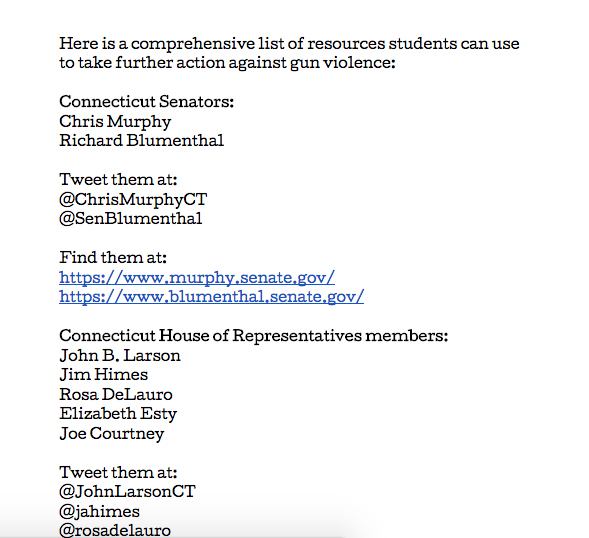 Editor Note / Questions: We do not know who compiled the list below or how the information on the list was selected, or who authorized this list be sent to students, and all but two of 14 references are democrat sources. Should we assume the administration at BPS/BHS approved this? Also, is it acceptable to parents for political information to be sent to students directly, via school email, and/or not notify parents of same? 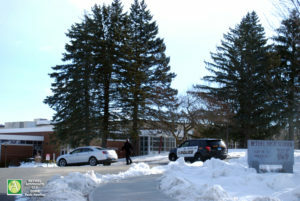 There was a Bethel Police presence at most school entrances (view photos below) preventing anyone from entering the school buildings, and Bethel Advocate (the only media there) was only eventually allowed to drive on the main road (Whittlesey) but not enter parking lots, or exit vehicle, according to Bethel Police Captain Pugner, who said it was a directive from the Chief of Police, when asked. 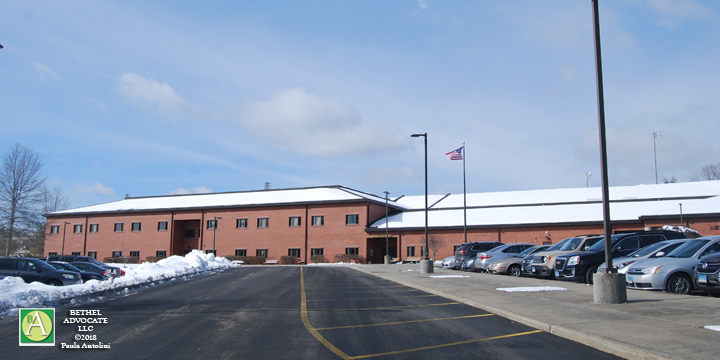 Editor Note: Once I was finally permitted to enter the school campus (on Whittlesey) I was allowed to pull to the side of the road near BHS for about 15 minutes, but then told to “move.” So I was able to capture only a few photos. Normally I shoot more close up photos but under the circumstances, it was difficult. Another email was sent only to students (and not parents/guardians) on Tuesday night, 3-13-18, at 9:22pm, indicating that the Wednesday “Advisory” event would first include “emergency procedures” then the “student-led presentation” moving the start time of the event to 9:35am instead of 10:00am. This was a slight departure from what the students were told the event would be in an email from Principal Christopher Troetti on March 9th, which never mentioned emergency procedures. 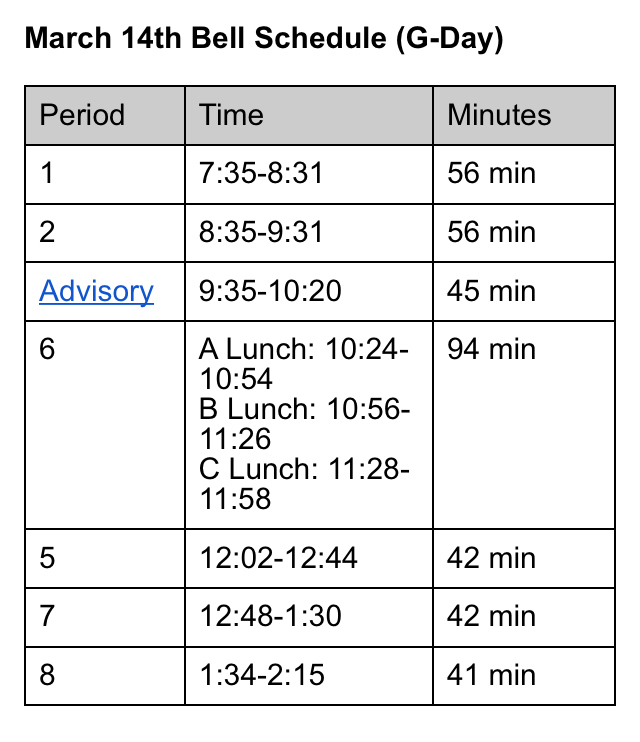 We have a unique bell schedule for Wednesday, March 14th. The link is HERE. During the first 20 minutes of Advisory, your teachers will review some critical information about our Fire Drill, Lock Down and Emergency Procedures. It is imperative that you pay close attention to this presentation since we will be reviewing protocols for various situations and emergencies. 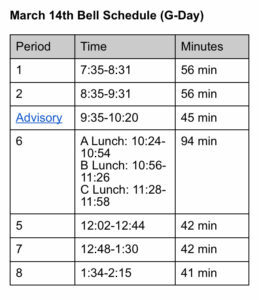 For the second portion of Advisory, students will be able to attend a student-led presentation in the gymnasium OR attend a learning lab. We moved the student-led presentation to the Gymnasium since the football field is covered in snow. 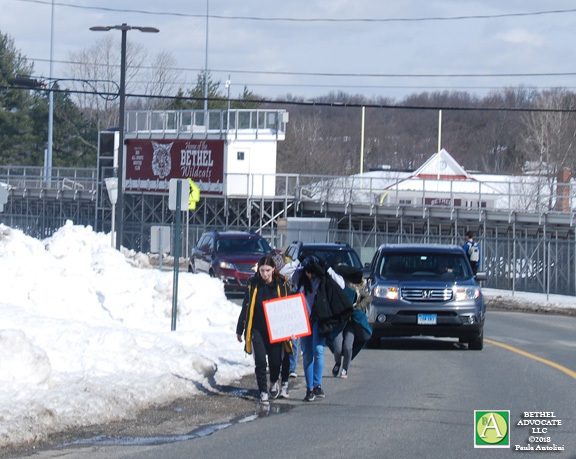 Photo above: Bethel students walking along the road near Bethel High School with protest signs,after just having exited the front door of BHS. Photo above: Bethel students walking along side Bethel High School with protest signs. 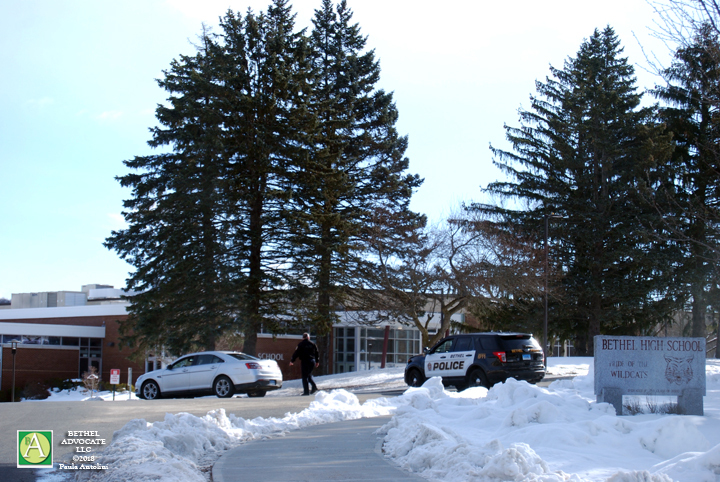 Photo above: Bethel Police cars block Bethel High School entrance to parking lot and front entrance of school. 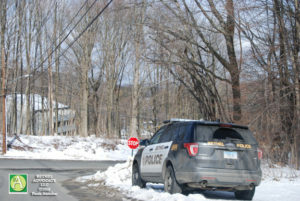 Photo above: Bethel Police in unmarked car block Bethel Public Schools campus entrance on Judd Avenue. Photo above: Bethel Police block Bethel Middle School, Johnson and Rockwell Schools entrance road off Whittlesey. 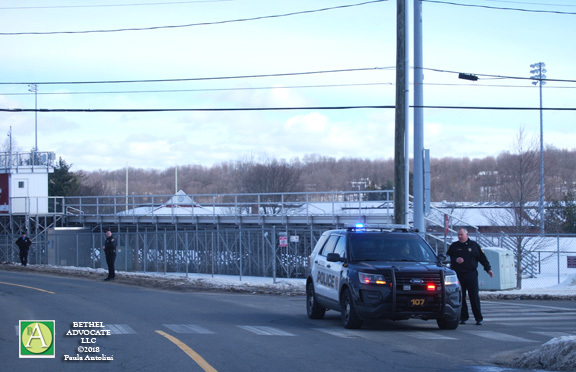 Photo above: Bethel Police were also stationed at Bethel Middle School entrance (see next photo, car was out of camera range to right). 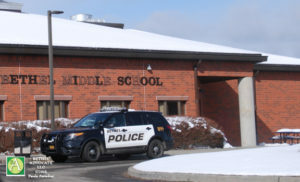 Photo above: Bethel Police were stationed at Bethel Middle School entrance. 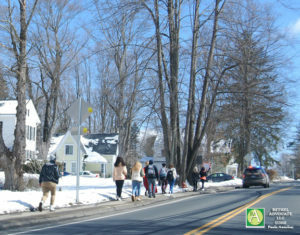 Photo above: Bethel students walking along Route 302 in Bethel, towards Route 58, with Bethel Police car riding in front of them near curb on left side of road. Photo above: Bethel students walking along road near Bethel Track and Field, towards Bethel High School. Photo above: A Bethel Police car blocks the back entrance of the Bethel High School near Bethel Track and Field, with several more officers standing along the sidewalk.